I’ve been busy with dissertation writing, but I have had time for a few odds and ends in the pop culture department that I wanted to share. In my Shakespeare in Film course that I offered last year, we debated the merits of digital versus 70mm and whether one would supplant the other. An article from WBEZ raised the issue again, and after I read that article Nicole and I ended up seeing Vertigo at the Music Box Theater’s 70mm Film Festival. 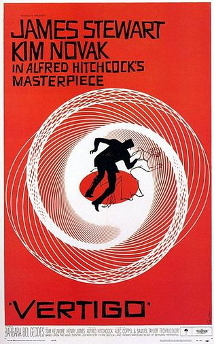 Vertigo was not technically a 70mm film, as it was shot in 35mm and a conversion/restoration print was made some time ago. The film received mixed initial reviews, but from what I’ve seen of Hitchcock it was one of his better films. Considering that he had little formal training in cinematography, he gets some iconic shots and (of course) the Vertigo effect on the camera that has been endlessly replicated in other films. The film sounded great as well, possibly another byproduct of the restoration. In terms of the merits of the film itself, there are issues of believably and somewhat shallow supporting characters (as well as some plot continuity, as the film was hard to follow at times). Rating it I would say around a B+. I started watching the show Cult on the CW network. There’s probably no jumping into this one if you haven’t seen the first two episodes. While the acting is subpar and the pacing of the show is not done well (especially the second episode which had sections where a whole lot of nothing happened), the premise is intriguing. It’s essentially a show within a show, where characters in the show watch a show called Cult which doles out clues to a rash of disappearances and crimes happening to the main characters, most notably the disappearance of the protagonist’s brother who had strong connections to the obsessed fans of the show within the show. It’s a little confusing to try and explain, but I think that’s why I like it so far. Plus it’s not a reality show nor is it about post-war advertising executives, meth dealers, zombies, or vampires, which is a plus in my book. Possibly due to that last point, I’m guessing this show will be cancelled very soon. Also, it is overly ambitious and probably on the wrong network, but I don’t know much about television or the politics of television so I could possibly be wrong. I was a big fan of The X-Files as a kid and I even watched the less entertaining Millennium for most of its run, and this is the first show I have seen in a while that comes close to that level of ambition. I watched the “based on true events” film Compliance (2012) which collapses into one episode the worst parts of a real life “hoax” perpetuated by a man who forced management at a fast food restaurant chain to harass, intimidate, and sexually violate employees by posing as a police officer over the phone. Dir. Craig Zobel attempts to depict the psyche of compliance to authority figures that Stanley Milgram notoriously investigated following the Holocaust, and while he does succeed in presenting several difficult-to-watch moments, many of the characters often come across as rubes who barely stop to question what was wrong with making an employee strip over the matter of supposedly a small amount of cash missing from a purse. The actor playing the false police officer often comes across as apathetic in his line delivery, and certainly doesn’t cut the figure (or voice) of a master manipulator. Perhaps that was part of the point of the film (that this type of manipulation is easily done and ordinary people are mindless and easily bent to the will of a strong personality), but my opinion is that the cheaper route of making the audience uncomfortable was selected over the more difficult route of depicting an uncomfortable psychological truth. If the director felt that those involved truly didn’t stop to question the morality of their actions, I wanted to visually see why that was the case. The best theory I could construct from my viewing was that the obedience factor combined with the non-stop, rush nature of the fast food industry combined to make people blind to their actions. I was left wanting a better depiction of this environment. Punch Drunk Love does a far better job of depicting the grinding, psychological impact of stress and anxiety than does this film.